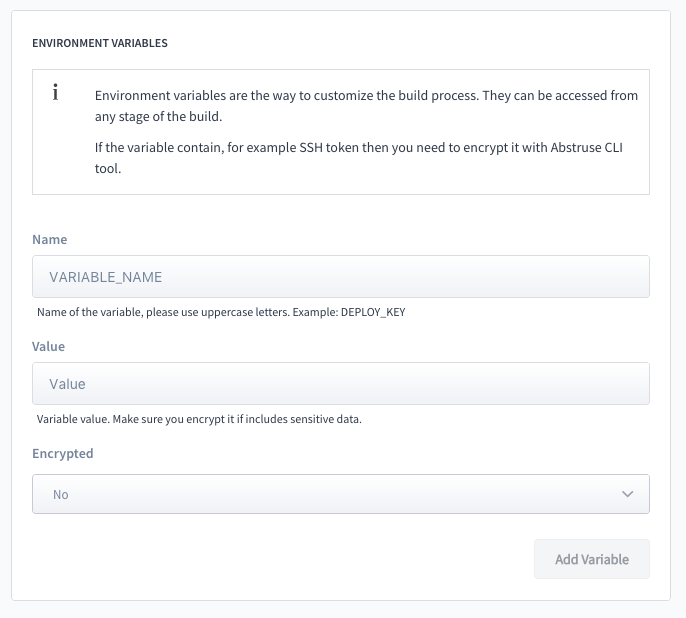 A common way to customize the build process is to define environment variables, which can be accessed from any stage in your build process. The absolute path to the directory where the repository being built has been copied on the worker. The id of the current build that Abstruse CI uses internally. The if of the current job that Abstruse CI uses internally. The commit that the current build is testing. The pull request number if the current job is a pull request, “false” if it’s not a pull request. if the current job is a pull request, the name of the branch from which the PR originated. If the current build is for a git tag, this variable is set to the tag’s name. if the current job is a pull request, the commit SHA of the HEAD commit of the PR. Set to true if there are any encrypted environment variables. Set to false if no encrypted environment variables are available. is set to 0 if the build is successful and 1-255 if the build is broken. You can define multiple ENV variables per item. contain sensitive data, such as third-party credentials (encrypted variables).